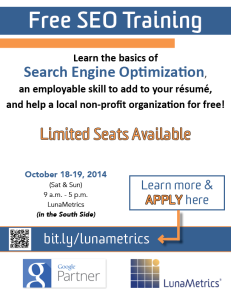 In 2013, LunaMetrics hosted its first free SEO training, designed for local students and recent graduates and partnering with local non-profit organizations. The event was so successful for all who attended that LunaMetrics will offer the free training again this year, over the weekend of October 18-19. The students who were chosen to participate in last year’s program left with knowledge of SEO best practices and experience optimizing a website for search engine traffic. These employable skills and experiences could be added to their professional résumés to help kickstart their professional careers in essentially any field. I also attended this training in 2013 and I also possessed the undiscovered passion that LaToya Johnson spoke of. I had an interest in social media marketing but very little knowledge of search engine optimization, so I eagerly applied and was accepted to attend the training. That training, led by Andrew Garberson (@Garberson), was unlike any college class or public internet marketing seminar I had ever attended. Andrew’s ability to convey the complexity of SEO to the entire room seemed effortless. Instead of being lectured, we discussed the topics together in a workshop style environment. So rarely are you offered the opportunity to make a real impact as a college student, but this wasn’t the case. Instead of hypothetical scenarios, we worked with real organizations, real websites, and real challenges! I made connections with many organizations during the training and followed up with them shortly after the training. I was offered and accepted a digital marketing internship with a non-profit organization. After its conclusion, I applied for an SEO internship with none other than LunaMetrics! Fast-forward one year and today I’m a bona fide member of the LunaMetrics Search Department working in SEO, SEM, and Google Analytics. This year, I’m returning the favor by conducting the training that I attended just over a year ago. This year’s training will be held on October 18-19th, 2014. If you’re a local student or a local non-profit who could use some SEO help, read through the descriptions here and consider applying! LunaMetrics is a company that cares deeply for the Pittsburgh region & its non-profit organizations. 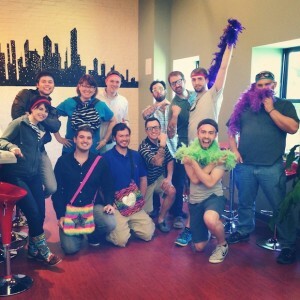 This summer, a wacky company-wide scavenger hunt raised over $400 to benefit a local non-profit that was chosen by the winning team. The Search Department recently began to implement policies that enable its members to offer consultation to their favorite charities. This training strengthens the local non-profits and helps ensure the future of a technologically informed Pittsburgh region.